Wasps usually nest in underground sites, often in wall cavities and roof spaces. The nest is roughly spherical and covered with shell-like lobes of paper. Made from fairly rotten wood, the paper tends to be yellow and quite brittle. An average full size nest can hold up to 5,000 individual wasps, female wasps are the stingers and each wasp can sting at a rate of 15 stings per minute. Nearly all the wasps in the nest are workers, smaller than the queen, but otherwise very similar. They collect food and building materials and do all the work in the nest. Adults eat nectar, fruit, and other sweet things, but the grubs are reared on animal food - especially other insects. Why must wasps nests be removed? Wasps can be very volatile and will defend their nests causing multiple stings. In severe cases a single sting can be fatal. 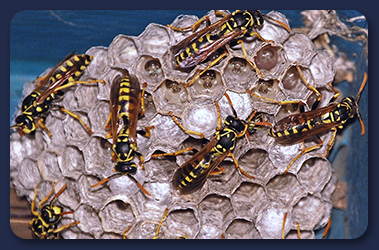 Determining where the nesting area is located is critical, but we strongly recommend that you contact a professional pest control company for wasp nest control, as these nests can be very large, and their inhabitants, extremely aggressive.